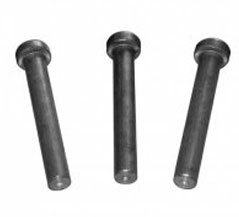 Shear Connector Studs are designed to tie the concrete to the steel beams and to resist shear loadings between the concrete slab and steel beam in composite construction. Length: Length is before weld. Stud when welded to base metal will be approximately 5mm shorter after weld and when welded through deck 10mm shorter after weld. Lengths for shear connector studs are generally set by governing specifications. Ask a Shearstud Ltd representative for other lengths available for specific applications. Made to order lengths are available upon request. FINISH : The above products are available in finish like Phosphate, Black Oxide, Galvanised, Hot Dip Galvanised, Cadmium Plating. Teflon (PTFE), Powder & many more as per Customer Requirements. We can aslo manufacture fasteners according to customers drawings and specifications. It is requested to buy direct from the company or see the invoice or documentary evidence from the dealer to ensure that you are bying genuine products of TUFF. We come to know that some dealers are supplying TUFF BRAND products while manufacturing at their own using inferior quality raw materials. High Tensile Fasteners and Stainless Steel Fasteners as per National / International Standards and Customer Drawings. Manufacturer and Exporter of Nuts, Bolts, Studs, Screws, Washers, Cap Screws, Sockets, Threaded Bars, Threaded Rods, Structural Fasteners, Machine Screws, Auto Fasteners,U-Bolts, Tension Control Bolts, Shear Connectors, Foundation Bolts and Fasteners as per customer drawing and specification in High Tensile and Stainless Steels. home | about us | products | quality | infrastructure | achievements | career | contact | enquiry | sitemap | become a dealer | become a supplier | fasteners Copyright © 2012 Pioneer Nuts and Bolts Pvt. Ltd.